Annual Christmas Ladies Appy Hour Logging About To Resume In Steelhead! Scroll to the bottom of the page to learn about a chance for Steelhead to win $500. Applications accepted starting January 31 through to March 21! Save the Date! National Wildfire Community Preparedness Day! Visit www.firesmartcanada.ca for more information. APPLY FOR A CHANCE TO WIN $500 FOR YOUR GROUP NEIGHBOURHOOD OR COMMUNITY! Commit a few of hours or the entire day and join others throughout the nation making communities a safer place to live. Challenge your neighbourhood, friends, family members, co-workers, community service group, youth organization, club or any other eligible group to create a project and accomplish something great together! Efforts will raise community wildfire awareness, help protect homes and help neighbourhoods and entire communities work towards becoming FireSmart. In collaboration and support from the National Fire Protection Association (NFPA), the Institute for Catastrophic Loss Reduction (ICLR), and The Co-operators, FireSmart Canada is pleased to announce stipend recipients on May 6, 2017. 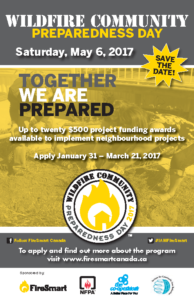 During Wildfire Community Preparedness Day on May 6, 2017 and through to September 30, 2017, communities across Canada are encouraged to participate in local mitigation projects to help reduce the risk of wildfire damage to their homes and neighbourhoods. Is your community working towards to becoming nationally recognized through the FireSmart Canada Community Recognition Program? Use this day as your FireSmart Day and enter to win $500 for use towards it! HERE’S SOME PROJECT IDEAS TO GET YOU THINKING! COME UP WITH IDEAS THAT WILL WORK BEST FOR YOURCOMMUNITY! You can start submitting project funding applications beginning Monday, January 31, 2017 through to Friday, March 21, 2017 11:59pm MT. A panel will review applications and select up to 20 project award recipients. The Union of British Columbia Municipalities is offering FireSmart grants of up to $10,000 each to local governments for support of FireSmart Community initiatives such as this. Contact your local government (Municipality, Regional District or First Nationals Band Council) and encourage them to apply. Find more information here by the deadline of January 27, 2017.